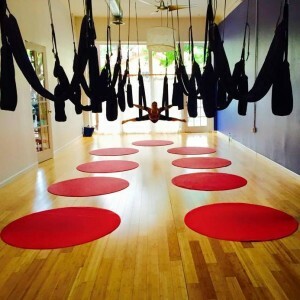 HAPPY TO ANNOUNCE NEW AERIAL YOGA PLAY CLASSES IN MARIN & DAVIS! Our Aerial Yoga Swings are specially made to be supportive, stretchy, and comfortable. They support your body in your yoga practice and increase your ability to enter into challenging poses, like backbends and inversions, with more safety and ease. Come discover that Aerial Yoga Swings are one of the most effective tools you can use to suspend the body, open up the spine, and create more space in the neck and lower back which provides a unique advantage in rehabilitating these commonly strained areas. Aerial Yoga Play is creating one of the most beneficial ways of using gravity to accelerate healing, while building strength, balance, and openness. Balancing the spirit of yoga with the joyful expression of dance, Aerial Yoga Play is a sensory-based movement practice that leads to health, vitality, connection, embodiment, strength, flexibility, and fun. It empowers people of all shapes and sizes by connecting the body, mind, emotions and spirit. Every experience can be adapted to individual needs and abilities. Step into the full breath of your own joyful experience with this unique blend of Aerial Yoga and Dance- positively shape the way you feel, look, think and live. Founder Jen Healy brings a broad spectrum of experience, style, talent and personality to their classes, as well as a ton of fun, humor, and play. So happy and grateful to offer the Aerial Yoga Play to you! !